Presentation - film about DINO-96 researches. 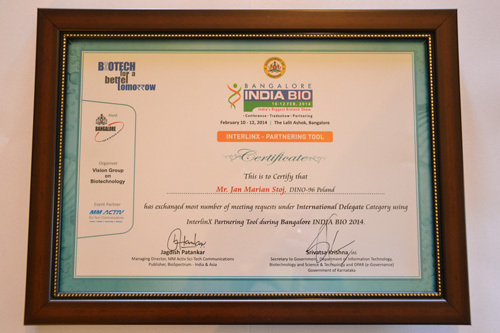 An exciting & exclusive event, the Awards Function recognises the contribution of Biotech Companies and Individuals for their outstanding achievements in the field of Life Sciences & Biotechnology. Selection process was performed by a well ideantified Jury. Indian Delegate Mr. Prasenjit Dasgupta, Yokogawa IA Technologies India Pvt. Ltd. Welcome on this site and you are requested to get acquaintance with this presentation. Somme comparisons and associations between the presented facts allow to broad-minded people to draw right conclusions. This topic is not for false scientists and for people who lack imagination. The presented solution in the field of biotechnology will force global changes in medecine, pharmacy, agriculture, etc. We have given the foundation and basis to be elaborated by specialists. Every country, every pharmaceuticals company, having at its disposal our solution or substratum, is likely to outrun the world’s leaders in the pharmaceutical field at low own costs because it doesn?t require complicated equipments. The form of cooperation may be diversified. For example, sale of biotechnologies, licences, substratum DINO-96 or ready to use products manufactured by pharmaceuticals companies. You are invited for cooperation as pharmaceuticals companies, research insitutes, banks and international organisations which want to or have the obligation to take care of our nation’s health, without the importance attached to the color of the skin or religion. The Arab and African governments are invited to use their means and to assist their nations where there is imposssible to employ high technology. 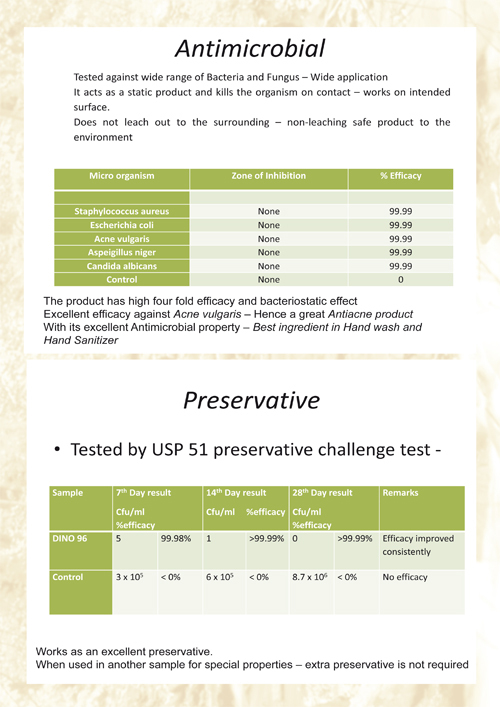 The methodology of biotechnological and therapy processes DINO-96 worked out by us, makes available in every country, with no regards to technological level of development, using local raw materials, the upgrading of the very environment protection and agricultural production. It is impossible to reach us through government authorities in Poland. Only direct contact with us. HIV/AIDS. 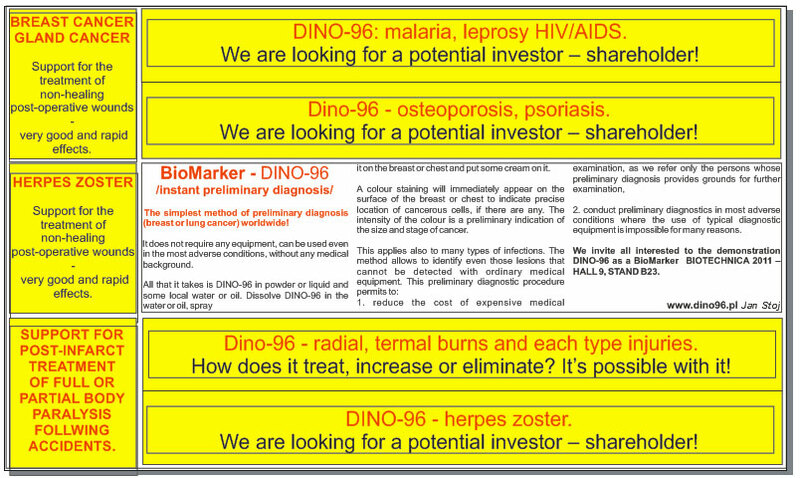 We are looking for a potential investor – shareholder! psoriasis. We are looking for a potential investor – shareholder! termal. How does it treat, increase or eliminate? It’s possible with it! types. How does it treat, increase, or eliminate? It's possible with it! How does it treat or increase or eliminate? 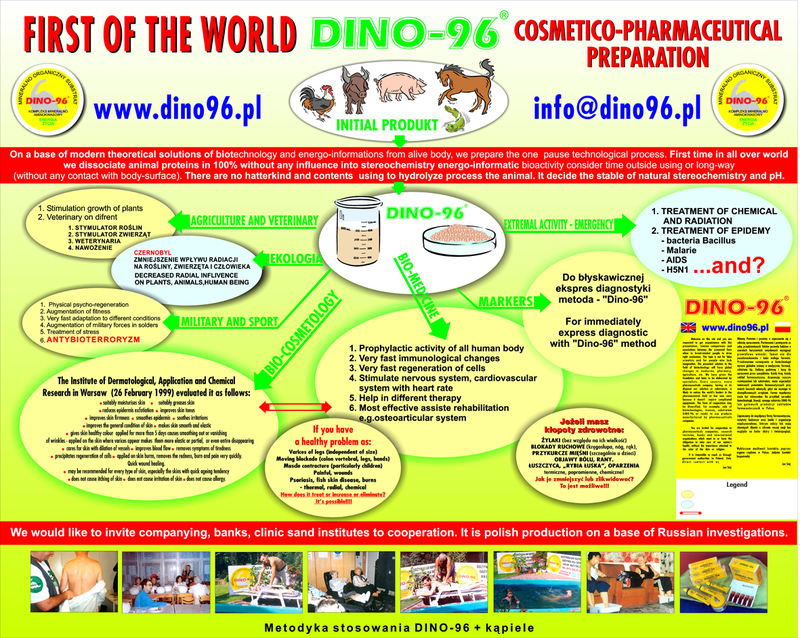 Based on relevant studies and observations contained in available collective reports, the website www.dino96.pl and the video published therein, we are presenting multiple applications of the DINO-96 substrate in the areas of medicine and pharmacy. 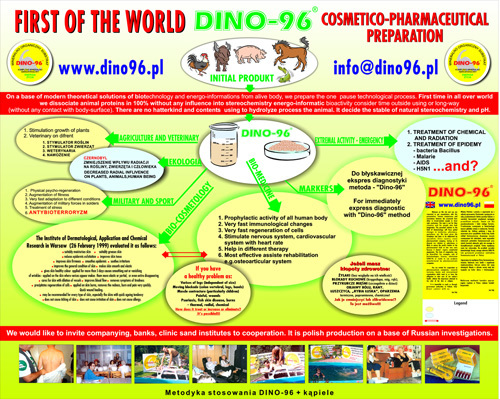 Our preparation, known under the conventional name of DINO-96, is registered in Poland as a cosmetic. Owing to its properties, we introduce it as a BASIC TREATMENT SUPPORTING COSMECEUTIC. This designation is supported by both analytical results, partial clinical trials and observations of medical specialists. 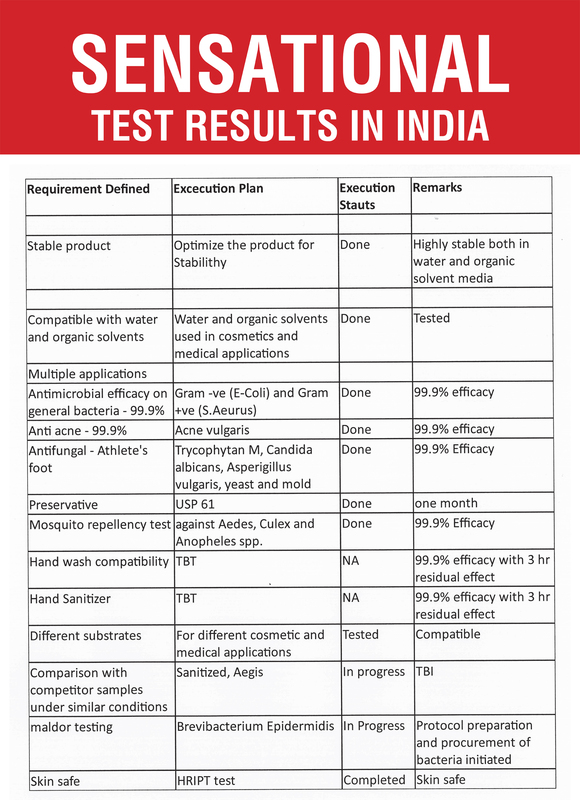 We have provided grounds for final studies to be conducted by research institutes or medical clinics specialising in many, often very different fields. 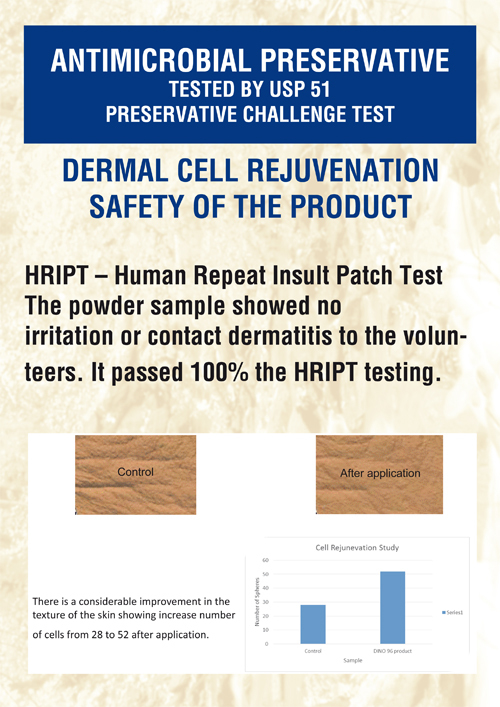 The product may be used directly on patients, as it applied externally (by spraying on it on an involved site to be covered with a cream or gel) or as an approved cosmetic!!! For many diseases, there is no other drug or preparation WORLDWIDE of similar therapeutic effects. It can be used as a component of drugs or a stand-alone agent. It is simple to use and applicable in any conditions, with just a basic training required. A pure substrate in the form of liquid or powder may be added directly to products such as water or locally manufactured oils. This will reduce costs of transportation and offer possibilities of use in extreme conditions!!! 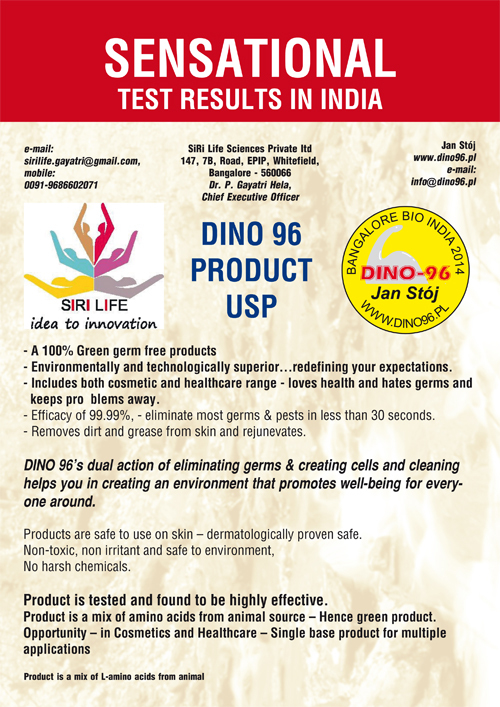 Additionally, as need be, we will be happy to provide unpublished information supporting the benefits of DINO-96! The simplest method of preliminary diagnosis (breast or lung cancer) worldwide!!! 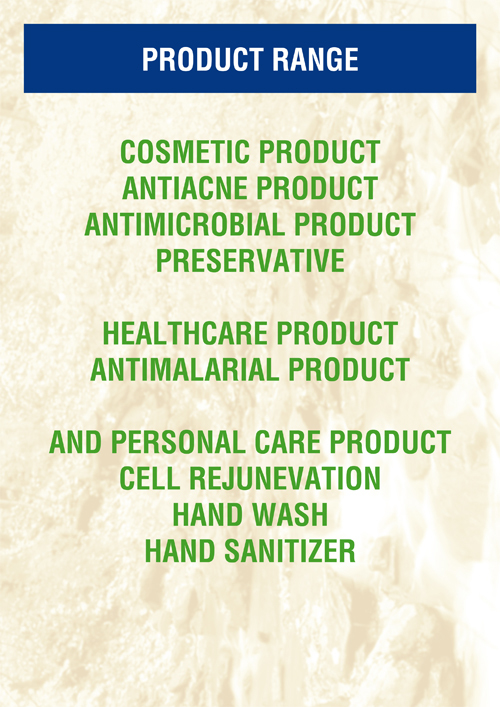 It does not require any equipment, can be used even in the most adverse conditions, without any medical background. All that it takes is DINO-96 in powder or liquid and some local water or oil. Dissolve DINO-96 in the water or oil, spray it on the breast or chest and put some cream on it. A colour staining will immediately appear on the surface of the breast or chest to indicate precise location of cancerous cells, if there are any. The intensity of the colour is a preliminary indication of the size and stage of cancer. This applies also to many types of infections. The method allows to identify even those lesions that cannot be detected with ordinary medical equipment. 2. conduct preliminary diagnostics in most adverse conditions where the use of typical diagnostic equipment is impossible for many reasons.